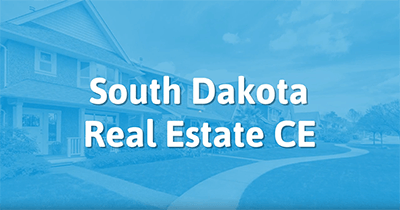 This course package offers a simple way to complete 12 of the 24 hours of continuing education that South Dakota requires for real estate licensees to renew their licenses. The course will begin with a class on Integrated Mortgage Disclosures according to TILA-RESPA Integrated Disclosures (TRID). This class will prepare real estate licensees to guide their clients through the disclosure process smoothly during a real estate transaction. Then the course will review a variety of sources that licensees can direct their clients to for financing. These include down payment assistance programs, as well as different loan program, government and non-government. Other methods of financing we’ll cover include sale and leaseback arrangements, and collateral assignments. In our Financing Documents class, we’ll talk about the different documents that are evidence of ownership and property debt. Then, we’ll review some real estate math that every licensee should be comfortable with using during transactions. Next, we’ll talk about the different ways that real estate is valued and appraised, as well as the tax basis for properties. Our final topic will be on the different types of foreclosure, and the possible remedies that homeowners may pursue when faced with foreclosure. 02. How is Mathematics Used in Real Estate? Sheri has been an online instructor for AYPO's Real Estate education classes for over 5 years and is a licensed real estate instructor across the United States. Growing up in a military family, Sheri became very patriotic, developed an adventurous spirit, and grew passionate about helping people. In 2005 Sheri became a principal broker and opened Oregon Ranch & Home Real Estate in order to better serve her clients. She received the honor of being ranked #5 in Southern Oregon for dollar volume sold for 2008, during one of the most challenging years the market has seen in decades. "Common sense, integrity, and a quick wit. These are qualities I admire". Why Should Tax Breaks Be for Poor OR Middle Class?